YOUNGSTOWN, Ohio — In September 2017, Richard Balog had “a bump” a bit smaller than a tennis ball surgically removed from behind his ear. His doctor said there was a 2% chance it was cancerous. Chemotherapy cleared up the 78-year-old’s cancer, but the treatments left him 30 pounds lighter and sapped his strength. His oncologist suggested he join the LiveStrong program at the YMCA of Youngstown. Six weeks in, Balog says his strength and endurance have improved, for which he credits the support of the eight other cancer survivors in his cohort. LiveStrong is just one example of the YMCA’s commitment to healthy living, which is one peg in its mission that includes youth development and social responsibility. And it’s a mission that goes beyond just fitness, says its president and CEO, Tom Gacse. 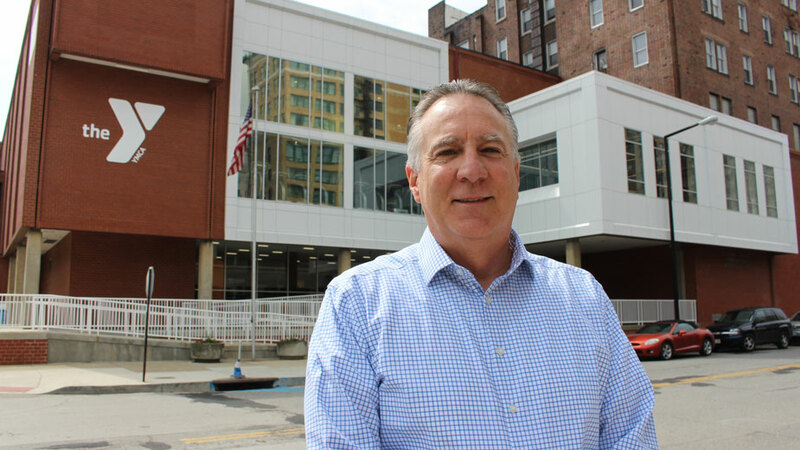 Pictured: Tom Gacse, president and CEO of the YMCA of Youngstown. Some of the Y’s 50 full-time staff are involved with the programs, as well many of its 1,227 volunteers and nearly 700 part-time workers, he says. Gacse is personally involved with LiveStrong, speaking at each cohort’s closing ceremony and sometimes sitting in on the weekly meetings. His mother died of colon cancer and his brother from Hodgkin lymphoma at 32. Others are inspired to continue the cause. Joyce Kohler, 62, joined the LiveStrong program when she was diagnosed with breast cancer two years ago and became a certified instructor after completion. LiveStrong has eight coaches and has served more than 120 survivors since the first cohort in 2014, says Loretta Pflug, the Y’s wellness program coordinator. Participants spend 13 weeks working on cardio, strength, flexibility and balance. Programs like LiveStrong, diabetes prevention and enhanced fitness are central to the Y’s efforts to promote healthy living, Pflug says. As illnesses like cancer, diabetes, Alzheimer’s disease and some metabolic diseases become more prevalent, “the Y needs to be proactive,” she says. This year, the YMCA of Youngstown started workplace wellness programs through a grant from the Ohio Bureau of Workers’ Compensation. To date, nearly 20 organizations have enrolled, Gacse says. 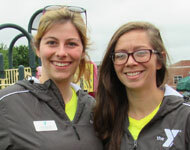 Such partnerships are important to the Y’s success in making an impact. A partnership with the United Way of Youngstown and the Mahoning Valley and Youngstown City Schools provided swim lessons to more than 700 children from the school district last year. Summer enrichment camps at the Davis Family and Central YMCAs serve more than 1,300 kids annually. From June 11 to August 24, students engage in physical activities as well as educational programming to prevent summer learning loss, says Nicole Murray, the Y’s day camp, youth and teen director. 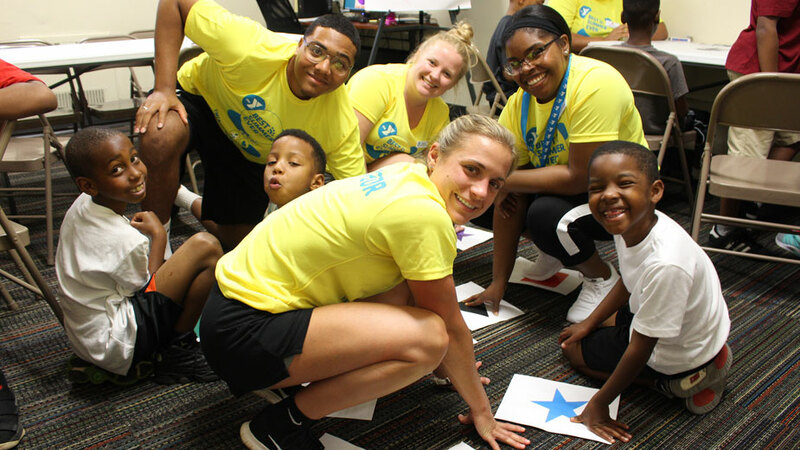 Pictured: Central YMCA day camp counselors Bethany Haddle (front), Michael Stevens and Maddie Pacifico play Shapes and Colors Twister with teacher Chelsea Danielle and campers Jaream Rutlbeg, Dennis Brown and Kashmere Wolmack. The Davis YMCA serves about 150 children daily while the Central Y sees between 30 and 40, all between the ages of six and 13. When Murray started as a counselor in 2006, only 50 children attended the Davis camp, she says. The response to the camps has been positive, with parents seeing improved behavior from their kids and better grades after camp, she says. It’s natural to not want to leave summer camp. So when Alexandria Baklarz turned 14 – too old to be a camper – she found a way to stick around the summer day camp at the Davis Family YMCA in Boardman. Baklarz volunteered as a counselor apprentice, or CA, until she was 18 and then took a job there as a counselor and CA Coordinator. As coordinator, she’s in charge of helping other volunteers transition from being a camper to a CA. Of all the experiences Baklarz had as a camper, the field trips especially stand out. Campers take trips to “so many amazing places,” including museums, baseball games and waterparks, she says. However, it’s that closeness in age, she says, that makes CAs such a vital part of the camp environment. As coordinator, Baklarz oversees about 10 CAs at the Davis day camp, some of whom are in their second, third and fourth years and will likely become counselors in the next year or two, she says. The volunteer experience helps teenagers develop leadership and social skills, which is something that she takes seriously, she says. And Baklarz is putting those leadership skills to practice herself. A 2016 graduate of the University of Mount Union, she just completed her second year as a part-time reading teacher at Market Street Elementary in the Boardman Local School District. Working at the camp served as inspiration for her career path, she says. The YMCA Camp Fitch in North Springfield, Pennsylvania, serves more than 10,000 children each year with summer programming as well as short-term camps and retreats during the school year, says Executive Director Matt Poese. Next spring, Poese hopes to break ground on a maker hub with 3D printers, chemistry equipment and wood and metal shops, he says. In addition to gaining knowledge and experience in the STEM fields, the hub will emphasize soft skills, including teamwork, risk-taking, independent thinking and persevering through failure, he says. Financial assistance for camp is available. For day camp, families can qualify for up to 70% of the cost. About 90% of Central Y families and half of Davis Y families receive financial assistance for day camp tuition, while a partnership with Neighborhood Ministries in Campbell provides free breakfast and lunch to children attending the Central Y camp. Through the YMCA of Youngstown’s annual fundraising campaign, 368 kids attended Camp Fitch with financial assistance last year, Gacse says. Funds helped 996 families and individuals receive YMCA memberships as well, including 152 children. Since 2015, ArtReach has brought art education to communities that don’t typically have such opportunities. From nursing homes and assisted living centers to the Rescue Mission of the Mahoning Valley and the Beatitude House, ArtReach uses art as a way to connect those populations to the community, says YMCA arts and humanities coordinator Suzanne Gray. 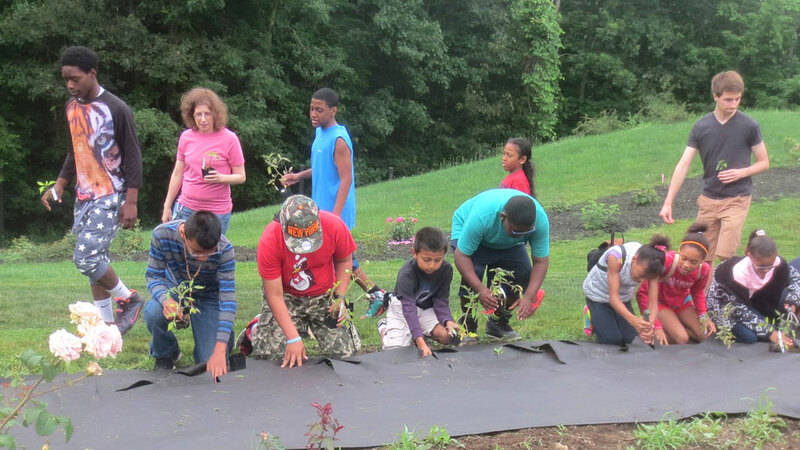 Pictured: Children from Casa Madre participate in a gardening program through ArtReach. Whether through drawing, painting or writing poetry, the classes give participants an opportunity to express themselves, Gray says. “We have an obligation to go out into the community and help everybody achieve success, to be their best selves,” she says. Kristina Rule, ArtReach team leader, recalls a class at the Compass Family and Community Services’ Daybreak Youth Crisis Center. One of the students was struggling with a still life drawing project. Rule helped the student complete the project “and he was so proud of himself,” she says. Later, while Rule was cleaning up the room, the student came back to thank her again. ArtReach class sizes range from three to 15 individuals, serving up to 150 across all classes, Rule says. Annual art shows, such as But I Know What I Like and Five Squared, give students a chance to display their art. Five Squared solicits art from around the world and helped raise $4,200 for the program last year, Gray says. Gray is taking a piece completed by the children at the Beatitude House to a library in Mexico and will return with a piece done by kids there. Another piece is being sent to children in Morocco, who will send back a piece. 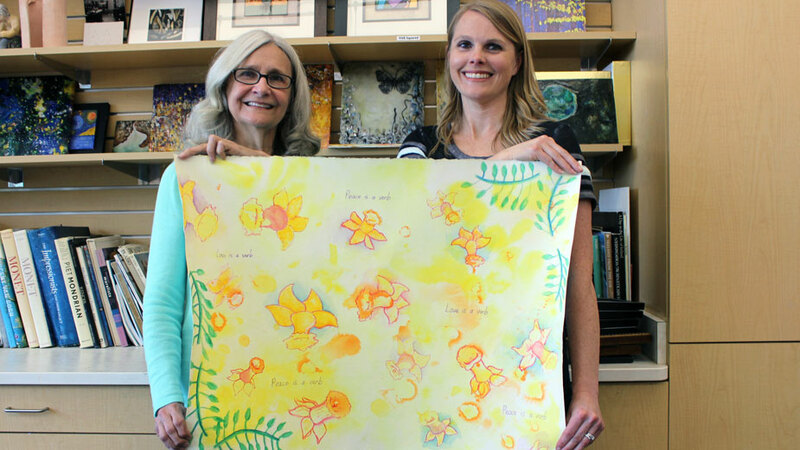 Pictured: Suzanne Gray and Kristina Rule display the art project being sent to Morocco. Community members can make a positive impact on the YMCA of Youngstown by making a donation or volunteering time to support the organization’s programs. The simplest way to donate is through the YMCA’s website, YoungstownYMCA.org, by clicking the ‘Donate’ button at the top right of the page. From there, donors can navigate to a secure donation page where they can make a one-time gift or set up monthly donations at preset or custom amounts using their credit card. Other options include making a donation in honor of someone’s memory, donating to a specific branch of the Youngstown YMCA and agreeing to cover any credit card transaction fees to ensure 100% of the donation goes to the YMCA. Donors can also visit the Y and speak with President and CEO Tom Gacse. To discuss gifts to specific branches, donors can meet with Central Y Executive Director Mike Shaffer, Davis Y Executive Director Tom Grantonic or Camp Fitch’s executive director, Matt Poese. They will work with donors to ensure contributions are earmarked to any specified program, Gacse says. Numerous volunteer opportunities are also available and interested residents should stop in at either the Central or Davis YMCAs and inquire at the front desk. “We’ve got lots of opportunities to give back to the community, and it’s rewarding,” Gacse says.